The albergue of O Cádavo, a cultural centre and the restaurant (Elixio) are situated next to the church. Only a small stroll separates the walker from the centre of the village, it has all necessary services: a chemist, a health centre, various bars and alternative accommodation, such as the hotel Moneda. To begin this stage pilgrims should return to the area of the albergue. They have a long walk to come and one that will take them to the historic centre of Lugo after travelling 31 kilometres on a variety of terrain. The Camino continues from the albergue of O Cádavo via the centre, well signposted by shell signs on the houses. Afterwards through Padreda and the last climb on the Primitive Camino (836 meters above sea level). Yellow arrows and a milestone indicate the direction. Walkers should continue parallel to the road on the right side. There remains 131 kilometres from here to Compostela. Pilgrims continue the descent to Vilabade and will encounter, next to the sanctuary of our Lady of Carme, a fountain, picnic tables and benches scattered under the trees next to the temple. It is the perfect place to stop and here they can also seek refuge in times of rain, assuming they have time. Lugo is located further away. Santa María de Vilabade is worth a visit and also the Pazo or manor house of Vilabade. 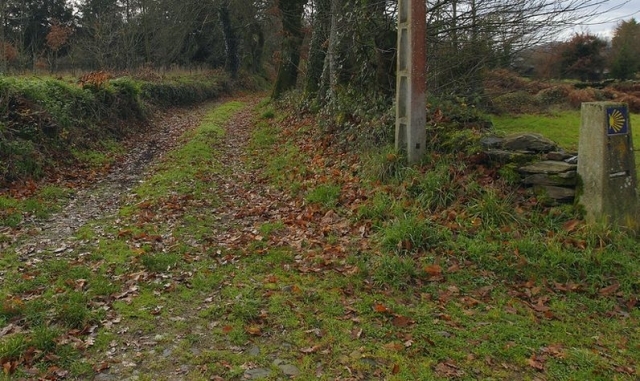 The Camino descends from Vilabade towards Castroverde along the road. It is impossible to get lost. At this point in the journey walkers will find the albergue and, the last place to purchase supplies before reaching the centre of Lugo. After the ruins of Soutomerille the Camino continues through Gondar de arriba, Castelo and Galegos de abaixo.